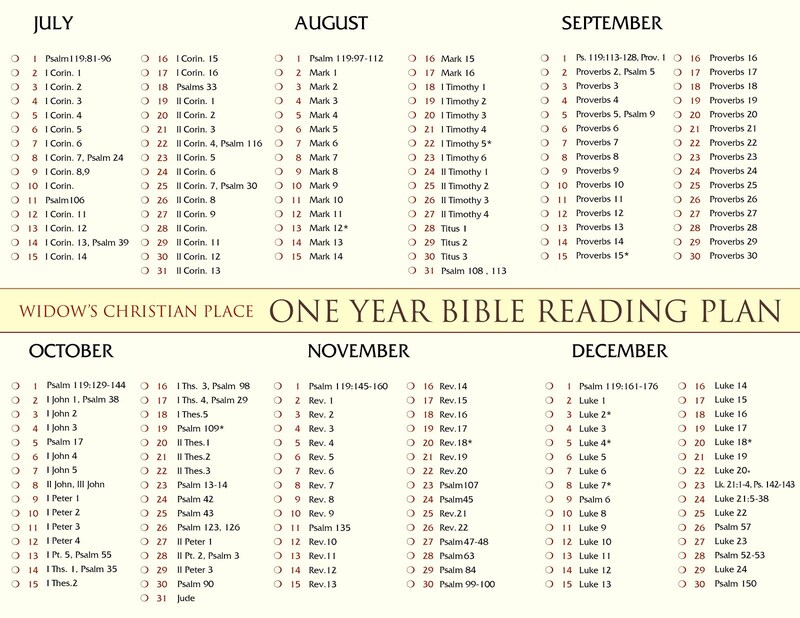 Starting this new year by using a Bible reading plan helps us know what to do next---and in the fog of grief when we have so many other decisions to make it's a very helpful guide. Last year I posted this plan at the beginning of each month and received good feedback and requests for copies for widows groups. So I recently asked a graphic artist friend of mine create these pages which can be printed on both sides of a standard 8.5 x 11 sheet of paper. Didn't she do a great job! Thank you Kelly! Her gift to me, and my gift to you! The 4 gospels--Matthew, Mark, Luke and John--are read one per season--winter, spring, summer, fall. You can start reading, or get back on track reading at any time without feeling like you have to "catch up" because books do not overlap into the next month. Eleven months start out with a section of Psalm 119 which reminds us of all the excellent things God's Word does for us! TO PRINT: Click the small images of the plan in the column at the right. If you're not able to print off a copy (especially if you are viewing this on a cell phone), just email me at WCplace@gmail.com and I will send you the attachments to copy. 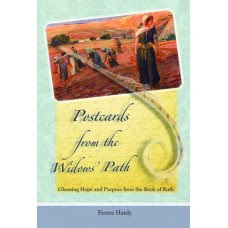 If you'd like me to mail you a printed copy please send a self-addressed, stamped envelope to me at Ferree Hardy, P.O. Box 5024, Florence, SC 29502 and I'll be happy to mail you one at no charge. You may reprint as many copies as you need. A business size envelope will work best. Reading the Bible anchors our day with encouragement, wisdom, hope and comfort. It gives us perspective and perseverance because it enables us to see the big picture of God's love and faithfulness. 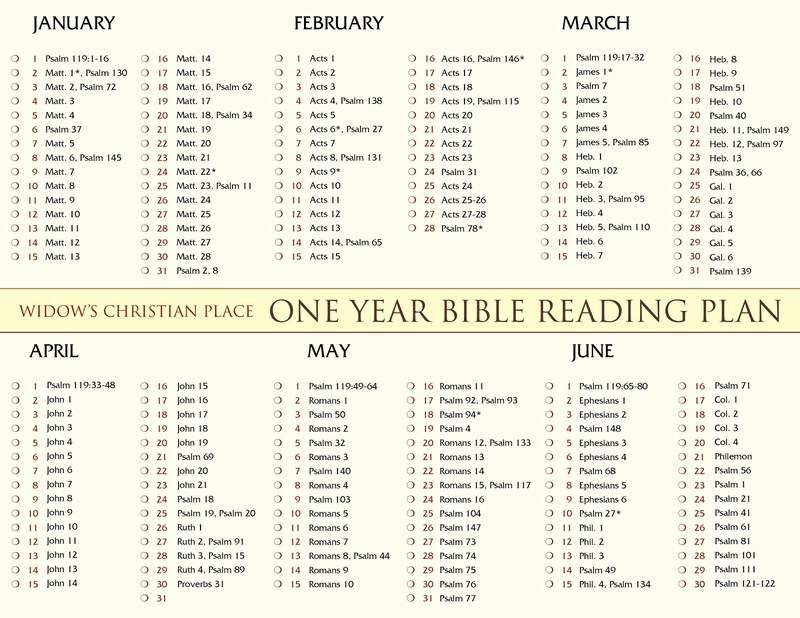 I hope you will get into God's Word this year and that this Bible-reading plan will be a helpful and tremendous blessing as you start into 2018! Thanks and best wishes for a memory filled new year! Thank you and New Year's blessings to you too Carolyn. Thank you for posting this again. I saw this last year but just couldn't get it together enough to follow through. This year I am taking a tip from my daughter who is bullet journaling and purchased my own Christian Planner. I printed the sheets out and cut them apart by month and prettied it up in my new planner ( A week late but they are short and I was able to catch up over the weekend.) Looking forward to the new year and a new plan! What a great idea! May God bless your reading this year!